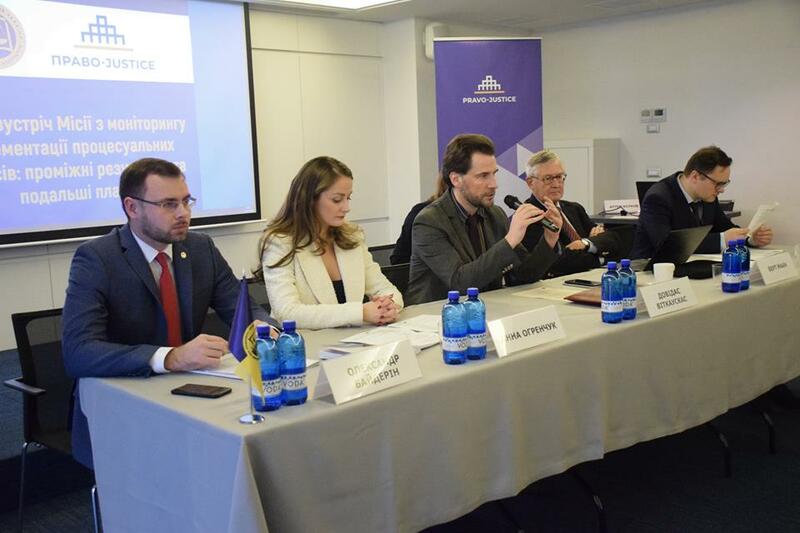 ODESA — The Ukrainian Bar Association jointly with the EU Project "Pravo-Justice" held a first meeting of the Mission on the procedural codes implementation monitoring aimed to discuss interim results and further plans on January 29. The event was opened by Anna Ohrenchuk, attorney, Head of the UBA Procedural Law Committee, Managing Partner of YuH LCF, a member of the Judiciary Reform Board at the President of Ukraine, who was the meeting moderator at the same time, Dovydas Vitkauskas, EU Project "Pravo-Justice" Project Team Leader, and Oleksandr Bayderin, attorney, Head of the UBA branch in Odesa oblast, Head of the Commercial Law and Process Committee of the Odesa Oblast Bar Council, who emphasized the importance of dialogue and discussions on the announced topics. The presenters, including Bert Maan, international expert of the EU Project "Pravo-Justice", Remco van Ree, international expert of the EU Project "Pravo-Justice" Project, Oleh Podtserkovnyi, Head of the Civil Law and Process Department of the National University "Odesa Law Academy", Doctor of Law, Professor, Associate Member of the National Academy of Law Sciences of Ukraine, member of the Scientific Advisory Board at the Supreme Court, arbitration judge of the ICAC at the Chamber of Commerce and Industry of Ukraine, Oleksandr Bayderin, attorney, and Artem Volkov, ANC Law Firm, head of the sea and transportation law practice, member of the Board of the UBA branch in Donetsk oblast. Bert Maan in his presentation shared the first results of the Monitoring Mission, told about the development tendencies, while Oleh Podtserkovnyi spoke about expectations of the second year of the procedural law reform. Moreover, Bert Maan shared the developments about the goals of the codes reform, which envisaged improvement of quality, promptness, impartiality, and emphasized the importance of training the process participants. Remco van Ree told about the standards of reforming the attitudes to the judicial system and the procedure in the comparative aspect.